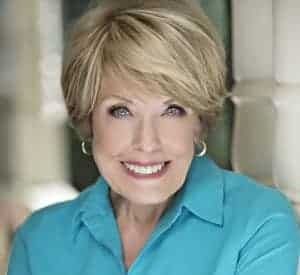 Now think about it … “spend less than you earn” is not the same as “don’t spend more than you earn.” That implies it would be okay to spend all that you earn, but no. The operative word is “less.” You need a gap between what you earn and how much of it you spend. That is the fundamental secret for living below your means. It’s in that gap that financial freedom can grow. You really need to read the rest of the book, but for now let’s just say that growing the gap is the challenge. Here’s an easy way to increase your gap this week—even if only by a few dollars, because it all adds up: Make your own bread. Wait! Hear me out. I have a recipe for you that is so amazing, so simple and so foolproof you’ll be tempted to call it Einstein Bread because it’s going to make you feel like a genius. 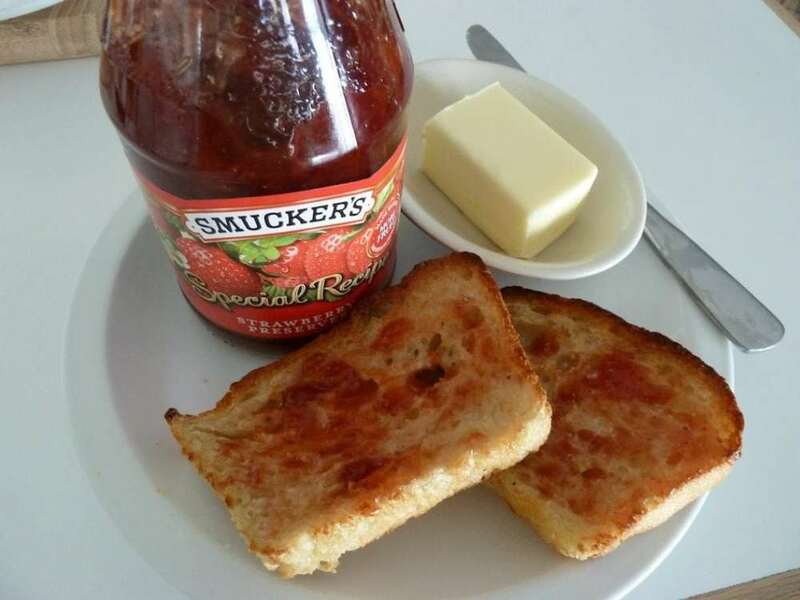 Actually this is English Muffin bread and trust me—toasted with butter and jam, this is pure heaven. So much better than commercial English Muffins (a package of six Thomas English Muffins is $4.29 or $.72 each at my local supermarket) and way cheaper. This recipe makes the equivalent of 24 English muffins for about $3 total or $.13 each, depending on how you purchase the ingredients … I buy flour and yeast in bulk). It makes awesome grilled cheese sandwiches, too. 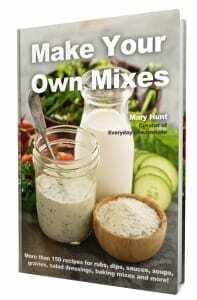 Place all ingredients in a large bowl and mix just until incorporated. It will turn into a very wet, sticky dough. 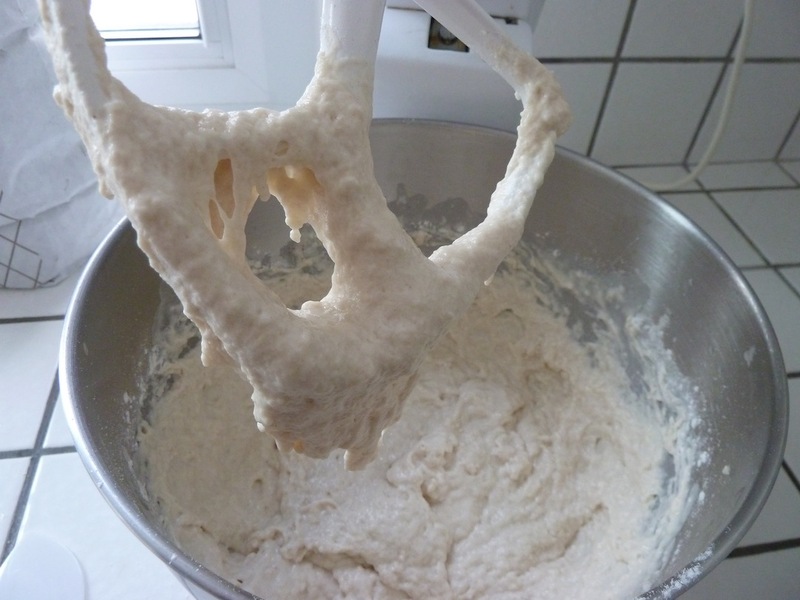 Just leave the dough in the bowl and let it rise until double in size. Spoon this sticky dough into four well-greased loaf pans. Let rise in pans until dough reaches the top of the pan. 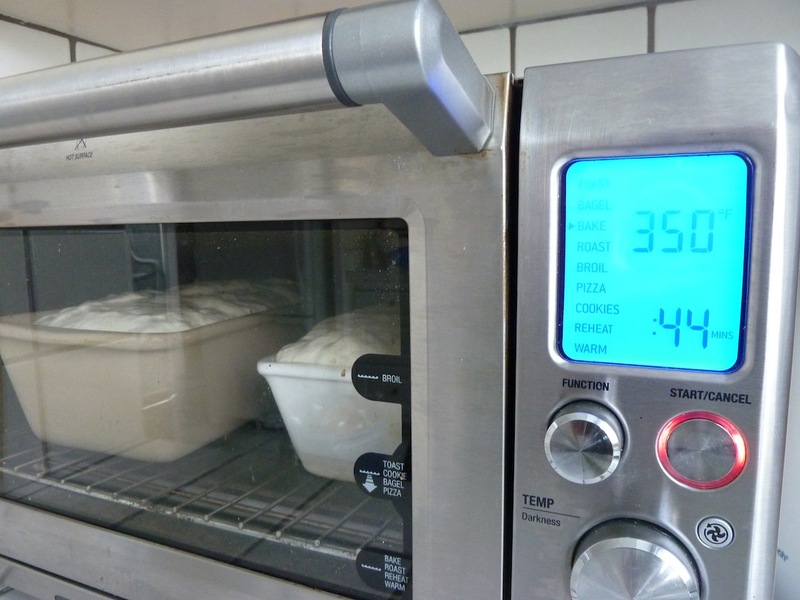 Bake in a preheated 350 F oven for 45 minutes or until golden brown. 10 minutes before done, brush with melted butter. Makes 4 loaves. Bread will be moist at first. Best if allowed to cool completely before cutting. 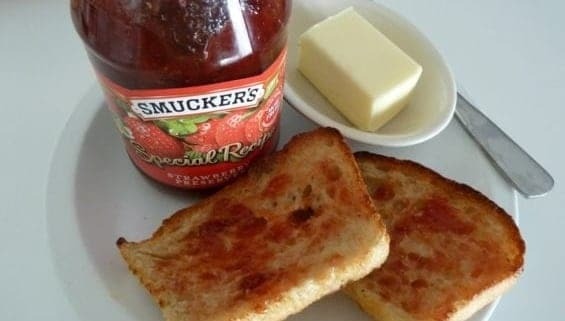 Makes the best toast. Can be frozen and this recipe can be cut in half to yield two loaves. 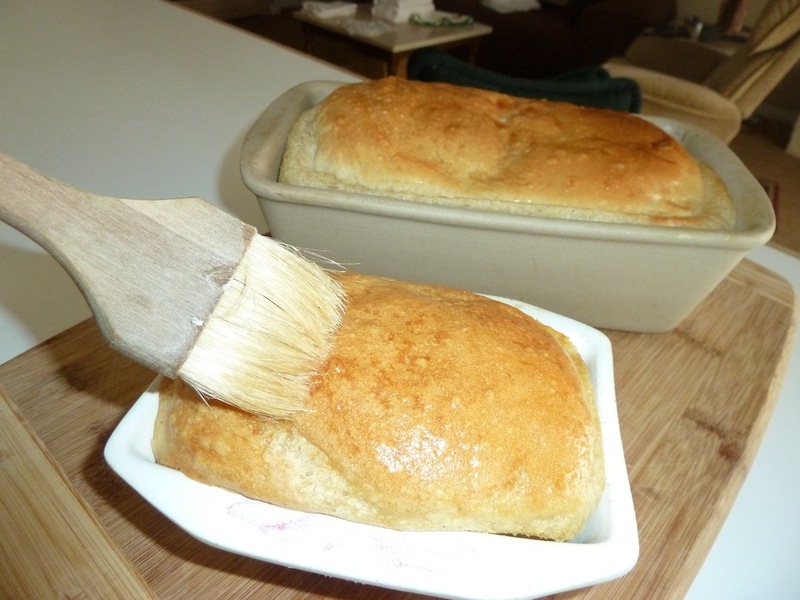 Here’s a little photo tour through the process to make this quick, foolproof bread. Please note that I cut the recipe in half, which made this one extra large and one small loaf. 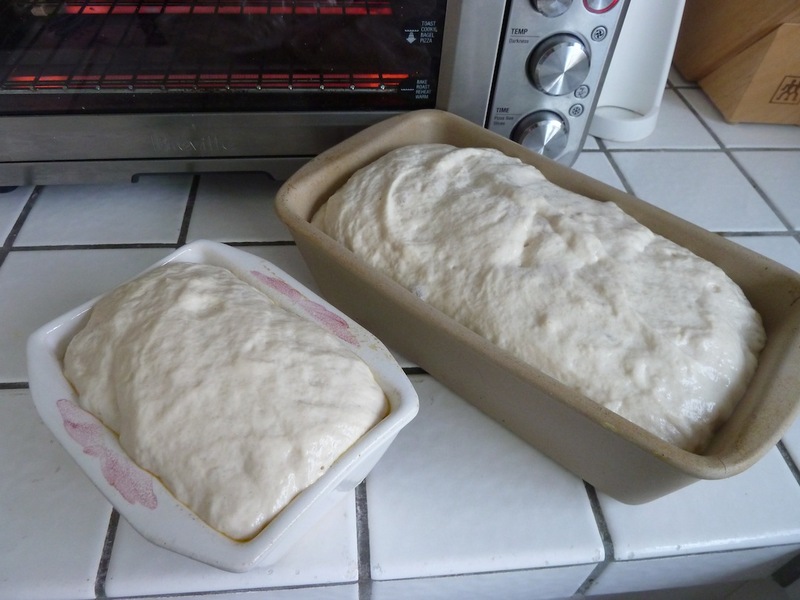 I spooned the wet dough into these two loaf pans and allowed the dough to rise again, to the top of the pans. Popped loaves into 350 F preheated oven for 45 mins. Brushed with butter after 35 mins., then returned to oven (that’s my beautiful Breville Smart Oven, which I use every day and wonder how I’d survive without) for the final 10 minutes. After completely cooled, I toasted up a couple of slices. Can you see all those nooks and crannies? Wow! So yummy. This bread is quite moist and stays fresh in a plastic Ziploc bag for two to three days. Freezes well.